A new yacht or a restored vintage or work boat? Architecture and design according to 3IDEE Azimut's Yachts Styling Department Bannenberg, yacht design par excellence Bridge design Castel Nuovo Decor Design Felicità West, birth of a queen Fernando De Almeida and the 110' Fast Expedition Yacht From start to concept design, the Explorer German Frers' Pure Boat Giovanni Zuccon, development cannot disregard research Glass in yacht design Ken Freivokh and the art of interpreting classic and ultra-modern yachts Kos, a Benetti with a reappraised classical style Large Open Yachts Legal safeguarding of intellectual property applied to yacht design Lighting design aboard, a possibility? Mario Pedol from sailing yachts to motor yachts from custom to series built yachts Mauricio Gomez and the first Azimut 116 Mirabella V Nuvolari & Lenard, italian style for the global market Openings in the hull, evolution and trend PAB, a different style Peter Sampson, an all round artist Rivolta 90 Sail and motor ever closer Some tendencies in megayacht interiors SuperMegaYachts Superyacht comfort - Noise and vibrations Technical The Evolution of Large Sailing Yachts from the 1960's until Today The Explorer, the stern as a dynamic and changeable place The exterior design of a yacht The great desire to go to sea The interview The start-up, aspects of superyacht design methodology The working superyacht Time passes... volumes increase Werner Yacht Design, a timeless classic Yacht Design: evolution or revolution? The intense season of the most important international boat shows has come to a close. 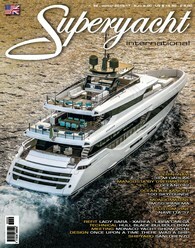 Among these the Cannes Yachting Festival spurred by the market's needs towards larger and larger yachts, the Monaco Yacht Show, which is still representing the most determining moment for b2b meetings concerning super and megayachts segments, and finally the International Fort Lauderdale Boat Show where the over 24 metre Italian yachting industry takes the lion's share. We can finalize some conclusions on this year and ponder on the next. The considerable number of Italian yachts exhibited in the course of the above mentioned events and the number of more or less imminent launches, are proof enough of the high level of international interest for made in Italy brands. Amer, Baglietto, Benetti, Cantieri di Pisa, Codecasa, CRN, Mondomarine, Overmarine, Sanlorenzo, Tankoa. Many more are currently busy building yachts with signed contracts in their pockets. We believe buyers' interest is motivated by the size of the investments these companies are dedicating in terms of styling, and above all in technologic innovation, engineering, in construction materials and last but not least in the hydrodynamics of the hulls themselves. In the wake of this success the importance of design where Italian school designers have been initialling Made in Italy yachts and those of several distinguished international brands as well which produce some of the most beautiful superyachts currently sailing should not be underrated. Among the signees there are a number of young and talented designers whose projects we have really admired in the course of the recent international events mentioned. Anyhow all things considered, and now that the international yacht shows are over until next season we have a listing of facts and figures published and elucidated by Deloitte which see Italy taking 39% of the superyacht market share in terms of units sold, followed some way behind by Holland with a steady 19% and so on down to the ROW.